It doesn’t look terribly dramatic. But it was a traumatic event. 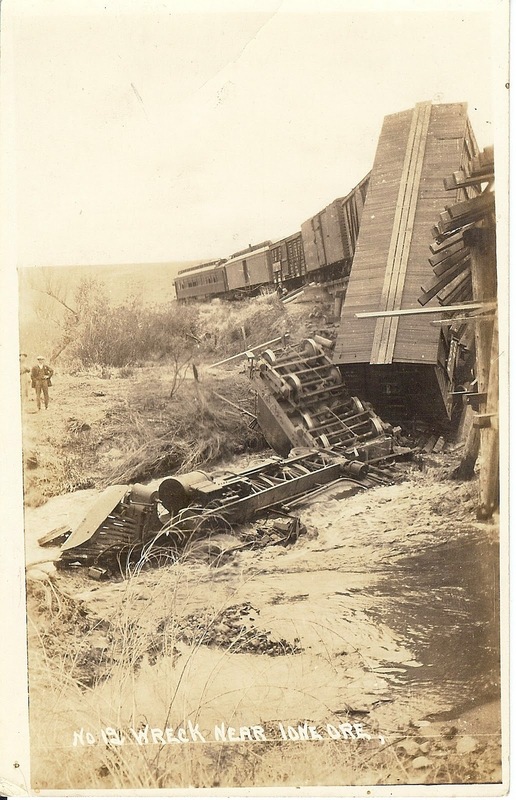 On May 12, 1917, a mixed* train of the Oregon-Washington Railroad and Navigation Company tumbled from a bridge over flooded Willow Creek near Ione in Morrow County. Engineer Ulysses Hanson (or Hansen) and J. Wyman (or Haybelt — accounts differ) , a maintenance foreman, were trapped in the wreckage and drowned. The Portland Oregonian reported on May 14 that “Hundreds of people from all over the county came to view the wreck yesterday.” A storm had raised water levels in creeks throughout the area, and the nearby Anderson farm was hit by a 30-foot wall of water that carried away an automobile, wrecked a windmill, and swept off construction materials for the building of a new bungalow. No doubt this raised recollections of the great Willow Creek flood of June 24, 1903, which demolished Heppner and took at least 247 human lives. 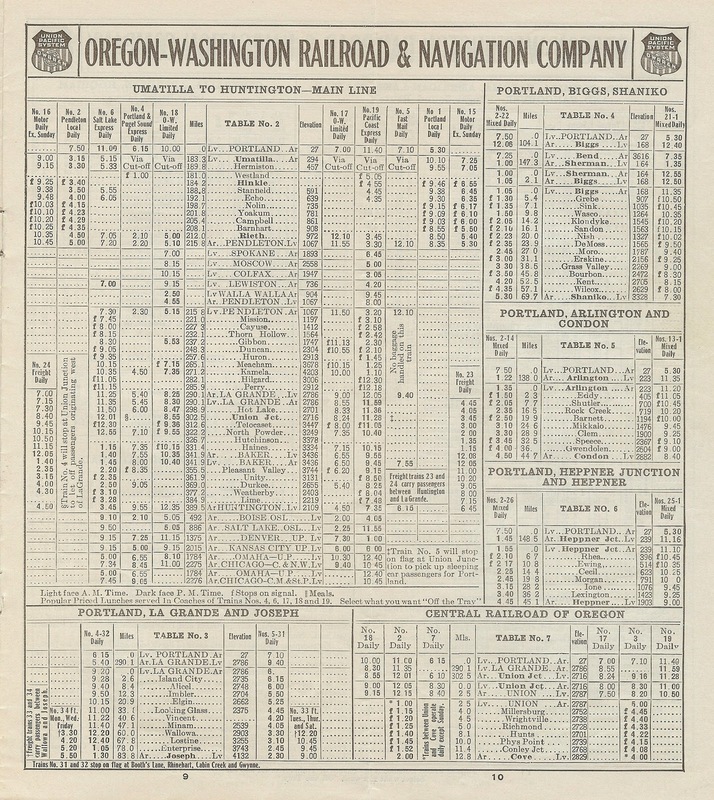 In 1917, the O-WR&N, part of the Union Pacific railroad system, ran a mixed train daily from Heppner through Lexington, Ione, and Cecil to Heppner Junction, a distance of 45 miles. The 9:00AM train from Heppner reached the junction at 11:10AM, just in time to meet a local train from Pendleton for Portland. Going back, it left the junction at 1:55PM, after meeting the Portland local, and reached Heppner, God willing and the creek don’t rise, at 4:45PM. This post celebrates the Multnomah County Library’s online, OCR-enabled access to the back files of the Portland Oregonian: hallelujah! The postcard noted on the back that the wreck had occurred near Horse Shoe Bend on May 19; the newspaper files corrected the date and added the story line. The postcard and the timetable are from my own collection. * A “mixed” train, in railroad parlance, is one that includes both freight cars and passenger cars. These trains ran at freight-train speed (rather slowly), and were once common on minor branch lines where the traffic did not warrant separate trains for passenger travel. « Oregon Historical Society Rediviva?